Hardcover, 14.75 x 11.75 in. / 322 pgs / 243 illustrations. The activity of the most glorious sailing yacht company, founded in Finland in 1966, in the official book published on the occasion of its fiftieth anniversary. For close to half a century, Nautor’s Swan has been the true sailor’s choice, designing and building luxurious, high-performance yachts in northern Finland. 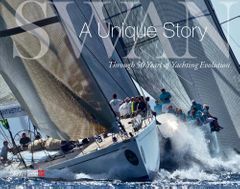 The value of a Swan is derived from the company’s strong heritage, skilled craftsmen, and pursuit of excellence in every aspect of the build. From the design process to production, the best-quality materials and innovative technology are used to deliver the most elegant and safest sailing yachts in the world. Working together with the Frers design team in Milan and Buenos Aires for close to two decades, Nautor’s Swan is committed to designing and building the most seaworthy and stylish sailing yachts in the world. Impeccable hull lines, nimble performance, and uncompromising comfort are the trademarks of a Swan’s design. Bianca Ascenti is a sailing, America’s Cup, and super-yacht specialist as well as a blogger, sailing-event PR person and yachting books author. She is contributor at il Corriere della Sera. Matthew Sheahan is head of performance sailing for the TV production company Sunset + Vine, where he is the producer of The World Sailing Show. Previously, he was the racing and technical editor of Yachting World magazine for 24 years, where he ran the magazine’s extensive boat-test program as well as reporting on some of the major events in the sailing world, like the Olympics, America’s Cups, and round-the-world races. FORMAT: Hbk, 14.75 x 11.75 in. / 322 pgs / 243 illustrations.